Testing: one, two, three. Testing: one, two, three. Here in the underground studio bunker my neurons are firing. Left and right, up and down, every which way. I don’t use filters, nor protection, I am an open vessel for media trajectories that move through the air, through wires and conduits and cables under the floor and up through the desk until they explode in my senses. That is my work as an artist: to induce self-inflicted blows of shock and catharsis in order to build up my immunity to the psychic and social consequences of the next technology. My brain is a laboratory for experimentation, and my sensory mechanisms have grown highly attuned to countering the media irritants that travel incessantly and invisibly through the spectrum. As a form of protection I have developed an x-ray vision that provides warning signals of what is to come. But most of all, I am continuously focused and engrossed in the process of building up immunity, much like a athlete rigorously exercises to build and tone the physical system. 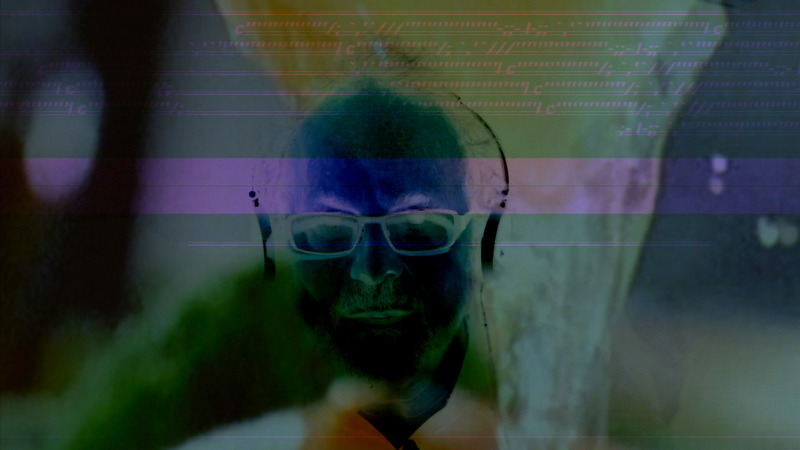 As a composer who was once immersed in the intricacies of high-caliber awareness to frequencies and rhythmic variations, I have turned my attention to all the media and their mechanisms, spectral peculiarities, waveforms, vibrations, and algorithmic constructions. It’s a rarefied technological universe I have ventured into, requiring advanced sensory skills and a tremendous capacity for concentration. At times, the pulse of my heartbeat and the coursing flow of my nervous system provide the perfect ambiance for acute states of composed silence. I’d like to think of myself as an explorer navigating the front lines of the medial wilderness, where I can contemplate the future of the cybernated landscape: a space where eventually we will all end up in due time. Further and deeper we collectively travel in this consensual hallucination, but as a true early adopter, I am determined to be there first and report back to you.